How is Your Airport Shuttle Different? For those seeking a Phoenix to Sedona shuttle service. We pick you up on your schedule 24/7. Our professional drivers are normally 5-10 minutes early at your home, or right on time at the airport. You get to pick the time we pick you up. 3 hours and 30 minutes before is normally enough time. The airport recommends you to be there 2 hours early to get through security and to your plane. Boarding usually starts 30 minutes before your plane takes off. However, one hour and thirty minutes is normally enough time. So if the drive from PHX or Sedona takes about 2 hours, then 3 and a half hours before your flight takes off if normally good. 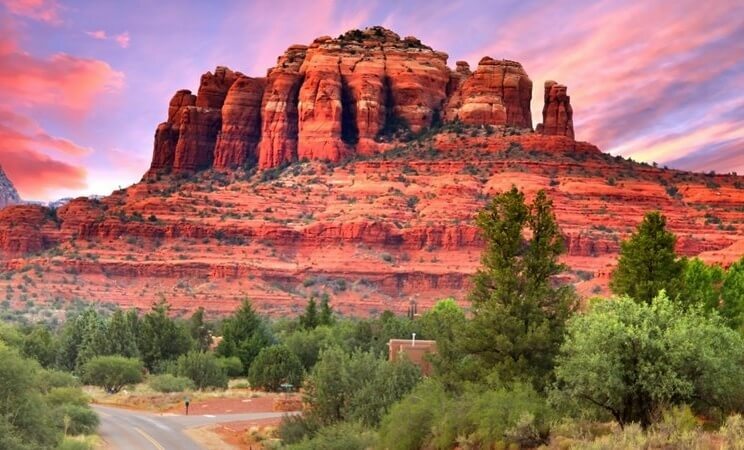 How much does it cost to go from PHX or Sedona, AZ? Uber and Lyft drivers often cancel once they arrive, because the app doesn't tell them where they are going until they arrive at your home or the airport. Usually drivers don't want to drive that far and not get paid for two hours to drive back, or they are unavailable to work for that long. This may result in you missing your flight after 2-3 of them cancel in a row, and they charge you $5 each time for the cancellation. You then try to contact Uber or Lyft over the next week to get a refund, and they don't even have a phone number. Another thing to consider is that Uber and Lyft drivers are never interviewed, so you may get a depressed guy complaining about his life, a tiny car with no leg room or a creeper. Uber and Lyft also do not train their drivers and the airport is moderately confusing to most people, so they usually have no idea where to go. All our drivers go through extensive background checks with the airport that are nationwide, require fingerprints and are done by actual law enforcement. Our Phoenix to Sedona shuttle reviews are awesome! You can see many of them in the right column under testimonials and reviews. There is no Sedona free shuttle, but if you know someone that wants to pay for your ride, then we can make it happen. We don't know too much about Ace shuttle Sedona except that they are a very small company. Small companies come and go all the time, they think transportation is easy until they actually do it and realize just how complicated it actually is. We get phone calls all the time for companies that went out of business either recently or years ago. Our service is very flexible, we even provide a mesa to Sedona shuttle, a Tucson airport shuttle, a Sky Harbor shuttle and an Arizona shuttle. There are actually a lot of shuttles in Arizona. Unfortunately, there is no train from Phoenix to Sedona. The Amtrak is in Flagstaff and Tucson and only goes east and west, not north and south. There are no trains in Phoenix or Sedona.